Runners start at the base of Mount Robson and run up the Berg Lake trail to the back of the mountain where glacial ice floats in the turquoise blue water of Berg Lake. Looking down on Berg Lake and the back of Mount Robson. Full marathoners run to the edge of the lake and the historic Hargreaves Shelter, ampoule and then return back to the start/finish. 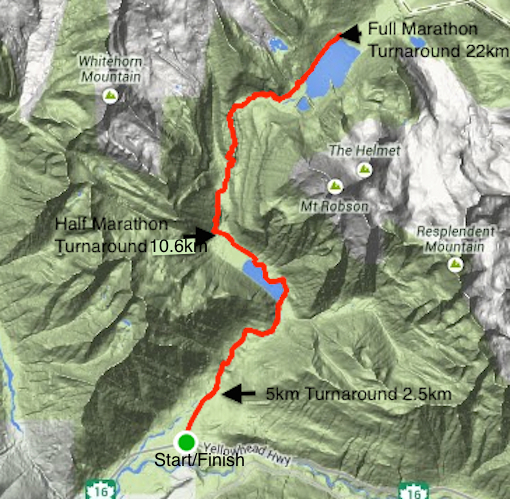 The Mount Robson Ultra Marathon, on Saturday September 7th 2019, will be an “out-and-back” run on the world famous Berg Lake Trail. The route passes through several different environmental zones and has its turn-around point just past the the shores of magnificent Berg Lake, truly making this marathon a one-of-a-kind experience. The route has been extended in 2015, to be 50 km long, an Ultra Marathon. 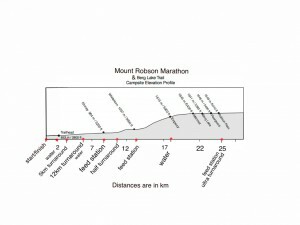 The ultra marathon has an elevation gain of 825m/2,700ft over the 25km to the turn-around point. The section from Whitehorn Campground to Emporer Falls Campground climbs steeply and almost continuously through the Valley of a Thousand Falls for about 5km, with an elevation gain of about 500m/1650ft. Most runners will find themselves walking much of this section. 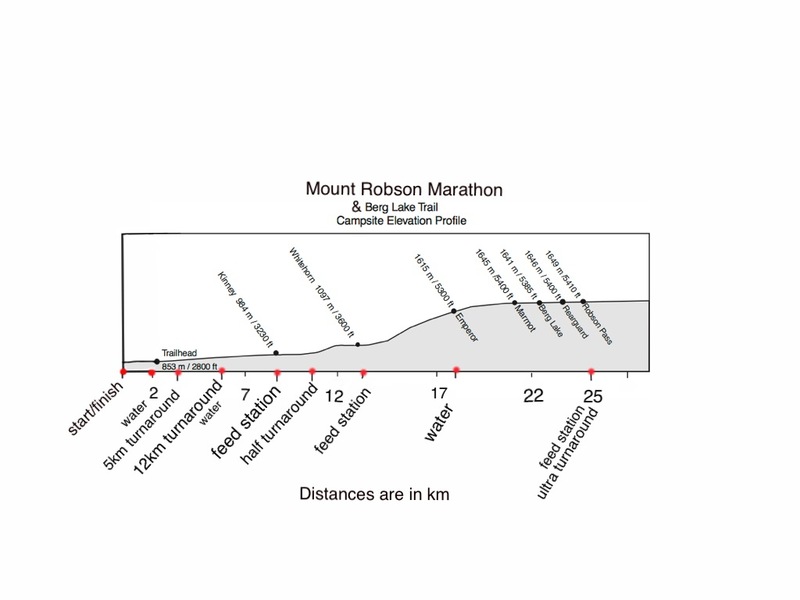 Online registration for the Mount Robson Ultra, and all other events, will open on March 1st on the Running Room online registration system. 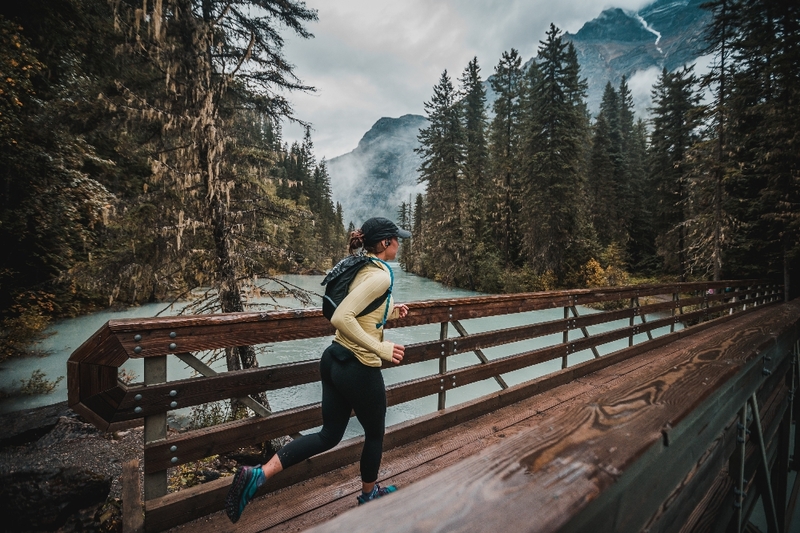 New for 2019, the Mount Robson Marathon will be partnering with Garneau Endurance Training, to offer a training camp for the Ultra Marathon. This is scheduled to take place July 20-21, with details to be announced in the spring. moderately steep incline followed by descent to Whitehorn Campground (aid station, 130m elevation gain in 2km). This is the location of the first cut-off for the Ultra Marathon. Runners will need to pass by this aid station by 9:45am. This allows 1hour and 45 minutes to cover the first 13km. the hard part – up Valley of a Thousand Falls to Emperor Falls Campground (aid station, 500m elevation gain in 5km). The top of Emperor Falls hill is the location of the second cut-off. Runners will need to pass through this point by 10:45 am. This gives 2hours and 45 minutes to cover the first 18km of the course which includes all of the major climbs. Aid stations located at Kinney Lake, Whitehorn and Robson Pass will be supplied with: water, Gatorade, cut up energy bars (Vega and Clif), and energy gels (E-Load and Clif). The Finish line aid station will have chocolate milk, cut up fruit, cookies, chips, Gatorade and water. All other aid stations will have water and Gatorade. Cut-offs will occur at 9:45 am at Whitehorn Campground (13km in to the race), and at 10:45 am at the top of Emperor Falls hill (18km in to the race). Runners reaching these cut-off points after the indicated time will be turned around and unable to complete the full ultra marathon.